Today’s post is all about the ragi kozhukattai recipes for babies and kids, one of the healthy traditional recipes of Tamil Nadu, usually prepared during festive days. Who doesn’t like kozhukattai or steamed dumplings? I remember the days whenever if it was idli for breakfast, my mom used to make kozhukattai or kolukattai especially for me on that ‘boring idli-breakfast day’ as I used to feel so yuck yuck to idli. You can also refer to the step by step recipe for making sprouted ragi flour at home. Ragi kozhukkatai or steamed ragi dumplings can be served to babies above 11 months if you have already introduced ragi and coconut separately. For older kids, these dumplings can be an excellent breakfast or evening snack options. You can prepare this ragi kozhukattai in two ways. I am going to explain to you both sweet and savory version here. Savory version is very good for diabetic patients. So pregnant moms who are diabetic, this recipe is for you. Also if your kiddo hates sweet dishes, savory ragi dumplings are for him/her. Heat a pan, dry roast ragi for 2 to 3 minutes on medium flame and keep it aside. Take small lemon sized mixture from the dough when it’s still warm and roll them into dumplings with your hands. What to do with left over ragi dumplings or ragi kozhukattai for kids? This is the most loved ragi recipe for kids and I’m sure every one in the family would crave for. If you are looking for ragi recipes you can also try the ragi puttu, ragi dosa, ragi idli, ragi cake, stuffed ragi paratha and ragi porridge recipes. 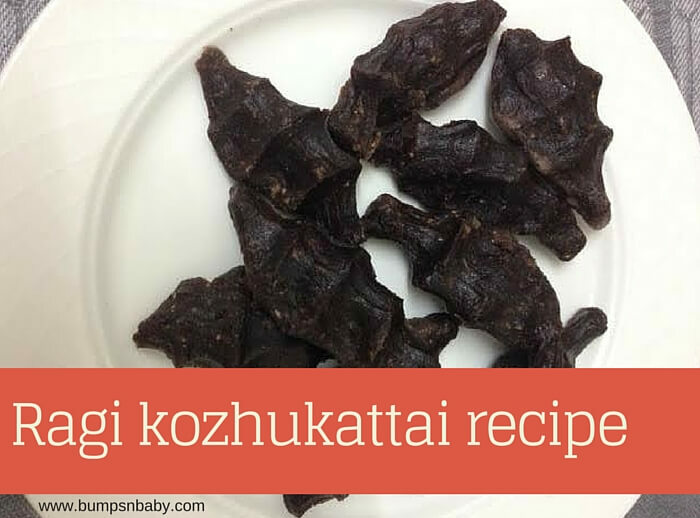 Do try these ragi kozhukkatai recipes and let me know in comments the response of your little one. Do share your innovative and healthy kozhakattai recipes with me in comments. Previous ArticleSunscreen for Babies and Kids – Is it Really Required? Next Article Can You Take Fenugreek to Increase Breast Milk?